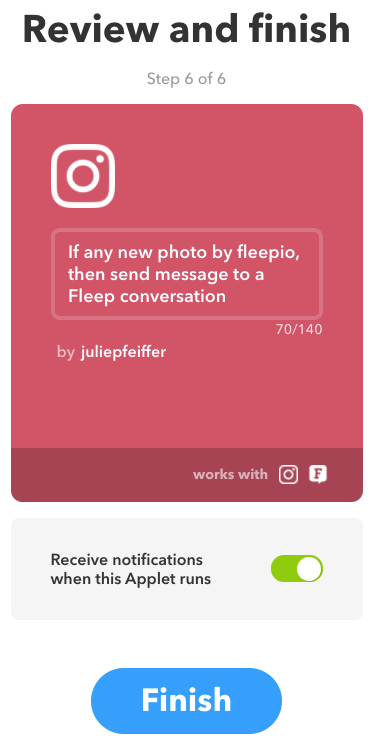 Fleep has an integration with IFTTT to post messages from IFTTT’s integrated services into Fleep conversations. 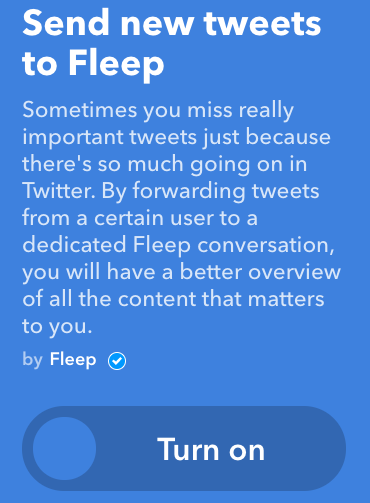 For example, you can send new tweets to Fleep, post weather reports to Fleep, publish a daily reminder to Fleep, and much more. 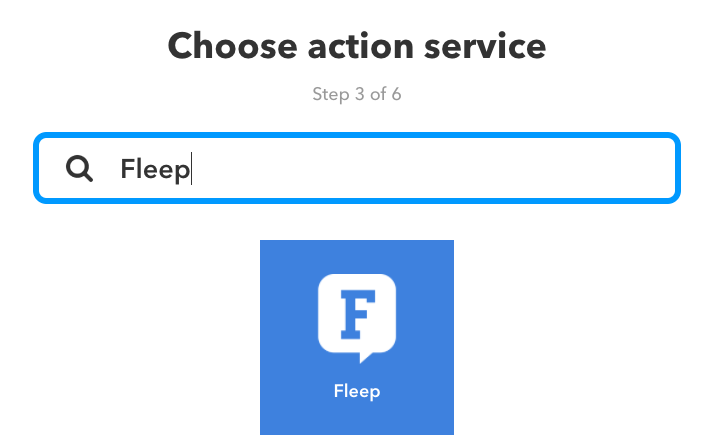 To set up an IFTTT integration with Fleep, you can (1) choose one of the existing Applets listed under Fleep on IFTTT or (2) create a new Applet. 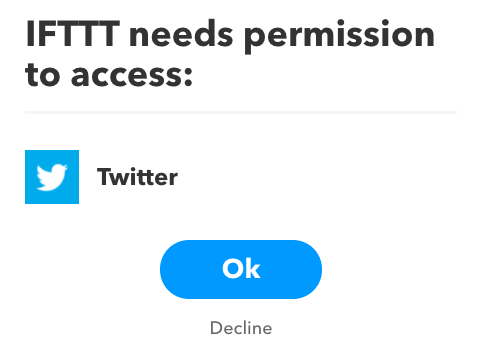 It couldn’t be easier to configure an existing IFTTT Applet. 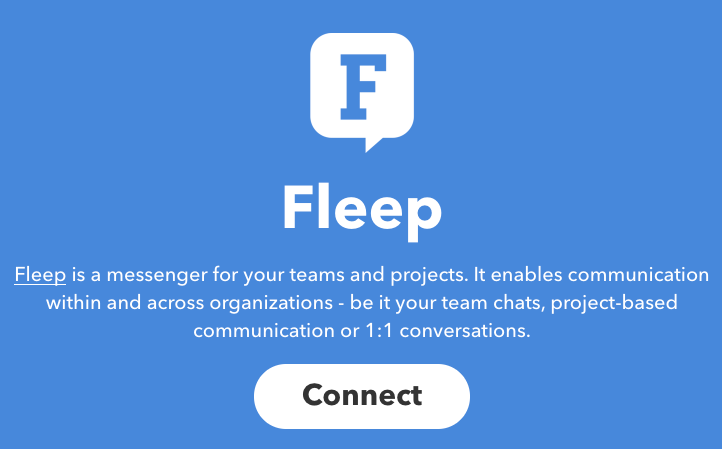 First, open Fleep on IFTTT and connect with Fleep by clicking on Connect. Next, pick one of the published Applets and in the view that appears, use the toggle to turn it on. Next, you may be prompted to connect to the other service and give access to your account on that service, if you haven’t done that already. Follow through the configuration – in this example, by choosing a username to watch on Twitter. 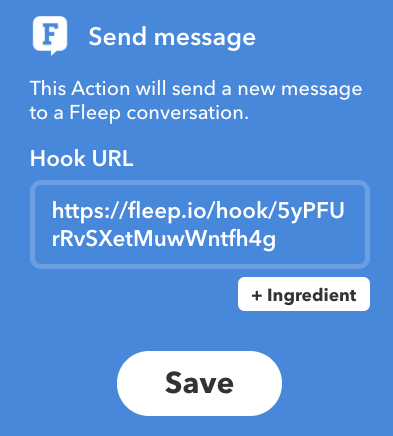 You will also be asked for the Hook URL of the Fleep conversation you wish to receive the IFTTT notifications to. 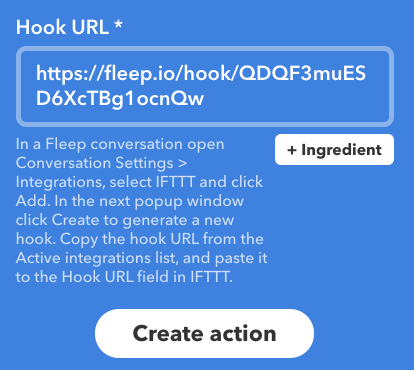 For the Hook URL, open the Fleep conversation on your desktop app or web browser, open Integrations in your Conversation settings, and click on the Add button under IFTTT. In the popup that appears, click on Create. 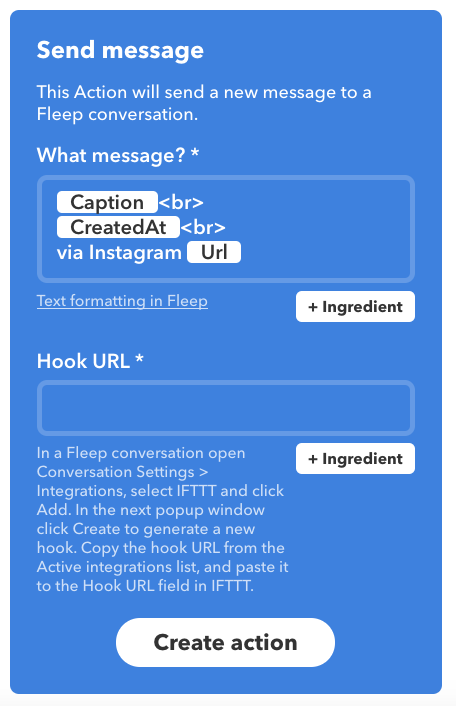 You can now copy the Hook URL (Incoming URL) and paste it into the appropriate field on IFTTT. Hit Save – and you’re done! 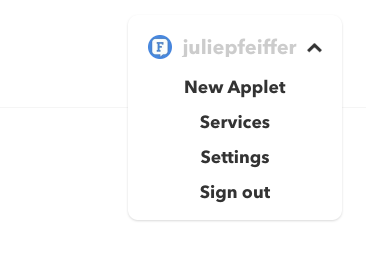 Choose “New Applet” from the account dropdown menu on IFTTT. Click on the blue +this. 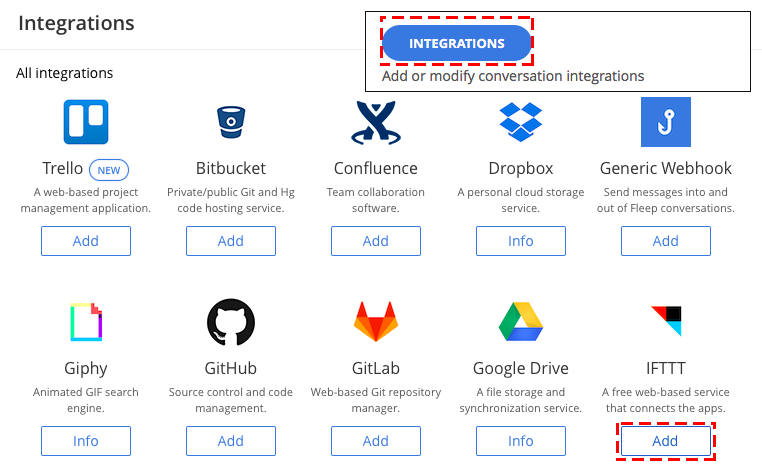 Now, choose the service you wish to post notifications from. 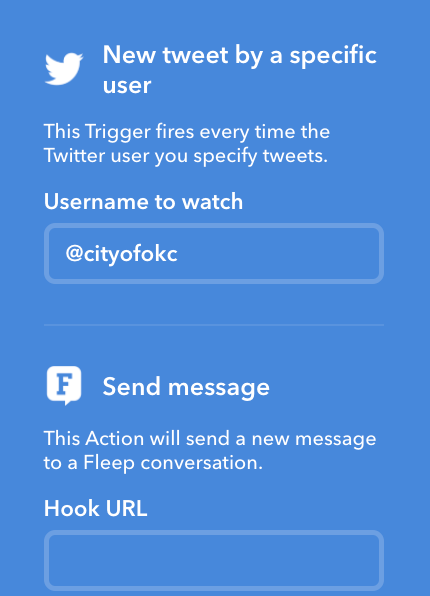 Next, you will have to choose a trigger for the Applet. Depending on the service, the triggers will be different. You may be prompted to connect to the other service and give access to your account on that service, if you haven’t done that already. 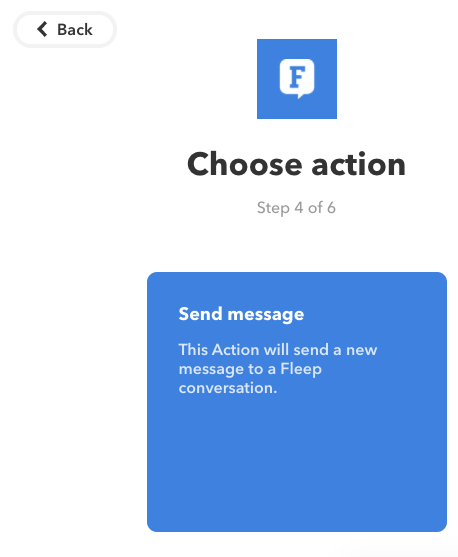 IFTTT will now prompt you to review the Applet – if it looks good, click on Finish.